Visceral, emotional, freeing are the words that come to mind when attempting to describe Katharine S. Ayers’ From Frozenness to Freedom: A Healing Journey. Recounting her personal journey of healing Ayers’ brings her readers through their own emotional/spiritual travels toward healing and wholeness. In pictures, poetry and words she bravely leads the way, exposing herself before causing you to yield to the instinctual desire to allow yourself to be exposed, evoked by her work. From Frozenness to Freedom: A Healing Journey is brief, but powerful. The images, both in pictures and words are evocative of deep transformation from pain and darkness to light and healing. As a reader your reaction will be to immediately relate her pain and suffering to your own. If you have been through abuse, neglect, pain, or disease her writing will touch wellsprings hidden deep within. There may be pain, but there will also be healing – deep and true. 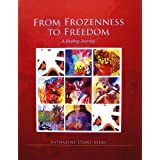 I highly recommend From Frozenness to Freedom: A Healing Journey. It is the true story of one woman’s voyage of transformation, but it is the beginning of your personal journey toward the same.